Having a blog of your own is a great thing as you can share anything you like and if you are among the few people who have the dream to be your own boss and want to live through online earning, blogging is the best way. Today I am going to show how you can create your own blog just in few minutes and that too without spending a single penny. My favorite is to have blog on custom domain but initially you can try on blogspot. So let's start with how to create a free blog on BlogSpot. But many newbie who doesn’t want to spend money initially and would like to enter into the fabulous blogging world, BlogSpot.com is the best option. And once you are good in blogging either you can choose a custom domain for your blog or you can move the blog to self-hosted platform also. BlogSpot let you create a free blog but it has few limitations but as a beginner it will not affect you. So for a starter it’s a good idea to create a free blog and get the hitch of blogging. Note: BlogSpot.com blogging platform is a Google product which enables you to create a free blog with the blog extension blogspot.com or blogspot.in and all the images are getting hosted through Picasa, which is also a Google product. This post is dedicated to the people who are new to the blogging world and want to start their own blog where he can continue with their dream. So now let’s come to the points. Below I am going to explain the step by step procedure to create your first blog. Step 1: The above image shows that you don’t have any blog with you right now. So let’s create it. Click on the “New Blog” button showing on above image and give the title for your blog and the domain name that you want for your blog and click on create it. Step2: Now you have just registered a domain with BlogSpot but your blog is not ready. At this time you will be at the blogger dashboard (this is the backend of your blog). 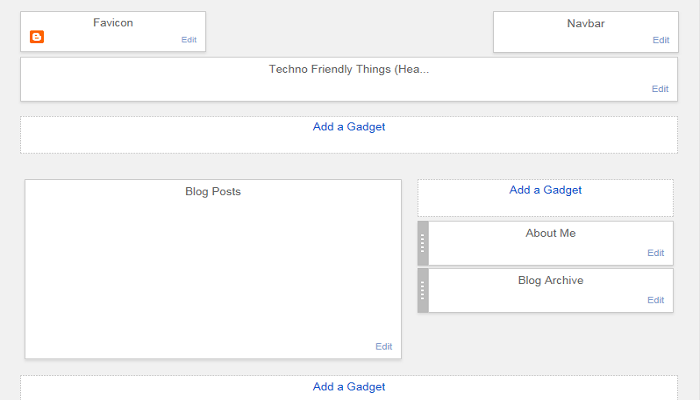 Now either you can continue with the limited blogger basic templates or choose your own templates from the net. There are many good looking templates are available free of cost for blogger. Now download any template for free. But the premium template is always the best due to its feature. You can get a premium template free of cost just by subscribing us. After subscription of TricksRoad, just drop us a mail and will send you a free premium template and will also guide you, in case of any difficulty. So for now, select any template from the internet and install it. Go to the dropdown in the below image and select “Template”. 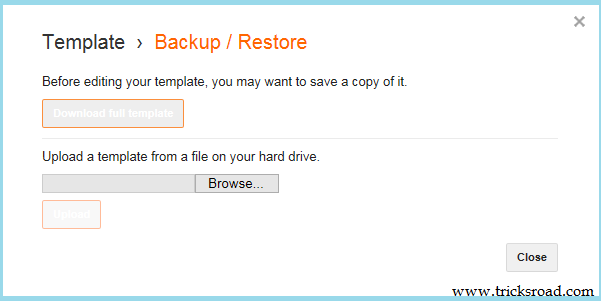 Now go to the top right corner and select Backup/Restore option. A pop up window will get open here. Now browse the xml file of your template and upload it. With this you are done with the template installation. At any points of time you can view your blog, just by clicking “View Blog” button at the top of the dashboard. Step 3: Now first create few pages for your blog like About us, contact us etc. For this go to “page” option and select “Create A New Page”. Give the title and content and then publish it. 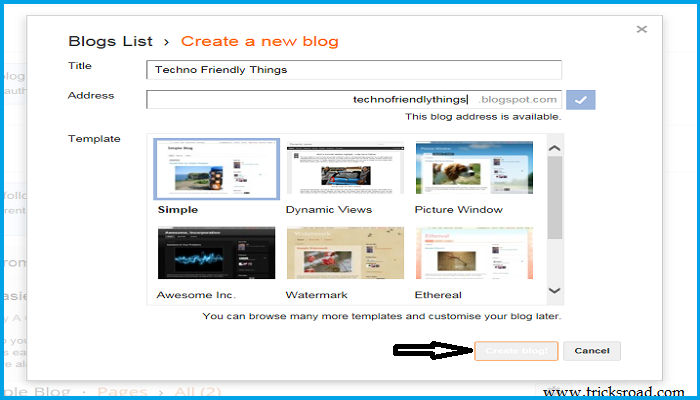 Step 4: Now create few posts for your blog. Just go to the post option and create a new post. Write the content and publish it. So now your blog is ready. If you want to add few gadgets like subscribe option, popular posts etc. follow few more steps. Go to the “Layout” section. And click on Add Gadgets. To add subscribe option, select the “Add a gadget” from top right and from a blogger list, add subscribe option. Similarly do for other gadgets also (a guide to customize the template will be available with the template). Now with this, you have created a good blog for you and you are having few posts also. Add some more posts and do some basic SEO like bookmarking. After this you will be getting few initial traffic. Then apply for the Earning. Go to Earning tab and select AdSense. Signup for the AdSense and once your account will get approved, you will be earning from your blog. So friend this was all about creating your first free blog. This was for those readers who don’t have a blog and want to create one. 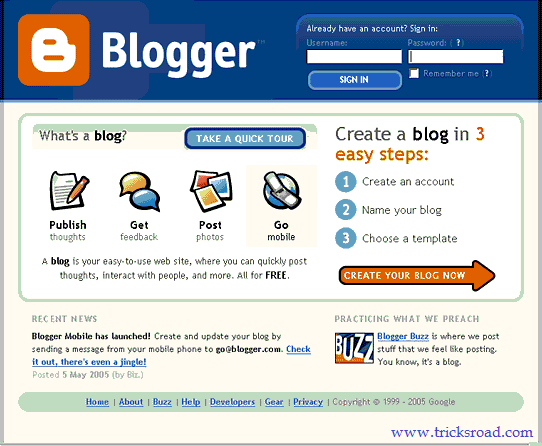 So just follow the above steps and get a blog right now. The whole process won’t take more than an hour. If you liked this how to create a free blog on blogspot post, please don’t forget to share it on Facebook, twitter and do subscribe our newsletter for the updates and freebies.